Amrtatva means immortality. So the modern civilization, they have no idea, either the great philosopher, great politician or great scientist, that it is possible to attain the stage of immortality. Amṛtatva. We are all amṛta. In the Bhagavad-gītā it is said, na jāyate na mrīyate vā kadācin. We living entities, we never die, never take birth. Nityaḥ śāśvato yaṁ, na hanyate hanyamāne śarīre Every one of us, we are eternal, nityaḥ śāśvato; Purāṇa, the oldest. And after annihilation of this body, we do not die. Na hanyate. The body is finished, but I have to accept another body. Tathā dehāntara prāptir dhīras tatra na muhyati. Dehino ’smin yathā dehe kaumāraṁ yauvanaṁ jarā. Sac-cid-ānanda-vigrahaḥ. God, Krishna, when I speak Krishna, that means God. If there is any important name… God, it is sometimes said God has no name. That’s a fact. But God’s name is given by His activities. Just like Krishna accepted the sonhood of Mahārāja Nanda, or Yaśodāmāyī, or Devakī, or Vasudeva. Vasudeva and Devakī were Krishna’s real father and mother. Nobody is real father and mother of Krishna, because Krishna is the original father of everyone. 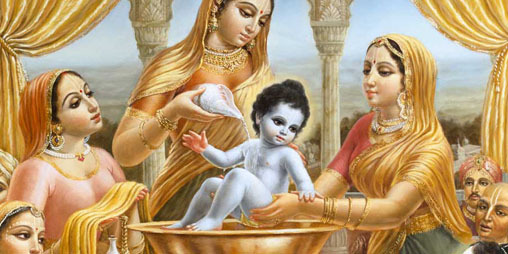 But when Krishna comes here, advents, He accepts some devotees as His father, as His mother. Krishna is the original, ādi-puruṣaṁ. Ādyaṁ Purāṇa- puruṣam nava-yauvanaṁ ca He is the original person. Then must be very old? No. Adyam purāṇa puruṣam nava-yauvanam ca. Always fresh youth. That is Krishna. When Krishna was on the battlefield of Kurukṣetra, you have seen the picture, He’s just like a boy of twenty years or, at most, twenty-four years old. But at that time, He had great-grandchildren. Therefore, Krishna is always youth. Navayauvanam ca. These are the statements of Vedic literatures. So, to understand Krishna, simply if we read as a formality the Vedic literature, it will be very difficult to understand what is Krishna. Vedesu durlābhaṁ. Although all the Vedas are meant for understanding Krishna. In the Bhagavad-gītā, it is said, vedaiś ca sarvair aham eva vedyo. Aham eva vedyo. What is the use of studying Vedas if you do not understand Krishna? Because the ultimate goal of education means to understand the Supreme Lord, the supreme father, the supreme cause. As it is said in the Vedānta- sūtra, janmādy asya yataḥ. Athāto brahma jijñāsā. Brahma-jijnasa, to discuss about the Supreme Absolute Truth, Brahman. What is that Brahman? Janmādy asya yatah. That Brahman means wherefrom everything emanates. So science, philosophy, means to find out the ultimate cause of everything. That we are getting from the śāstras, Vedic literature, that Krishna is the cause of all causes. Sarva-kāraṇa-kāraṇam . Sarva-kāraṇa-kāraṇam. Cause of all causes. Just like try to understand. I am caused by my father. My father is caused by his father. He is caused by his father, his father… Go on searching, then you’ll ultimately come to somebody who is the cause. But He has no cause. Anādir ādir govindaḥ I may be cause of my son, but I am also result of the cause, my father. But the śāstra says that anādir ādir, He is the original person, but He has no cause. That is Krishna. Therefore, Krishna says that janma karma ca me divyaṁ yo jānāti tattvataḥ . The advent of Krishna, it is very important thing. We should try to understand Krishna, why He advents, why He comes on this material world, what is His business, what are His activities. If we simply try to understand Krishna, then what is the result? The result is tyaktvā dehaṁ punar janma naiti mām eti kaunteya . You get that immortality. The aim of life is to achieve immortality. Amṛtatvāya kalpate. So in the advent of Krishna, we shall try to understand the philosophy of Krishna. His Excellency was speaking of peace. The peace formula is there, spoken by Krishna. What is that? If the politicians, diplomats, they are trying to establish peace in the world… The United Nation is there, and there are many other organizations. They are trying to have real peace and tranquillity, no misunderstanding between man to man, nation to nation. But that is not happening. That is not happening. The defect is that in the root is wrong. Everyone’s thinking “It is my country. It is my family. It is my society. It is my property.” This “mine” is illusion. In the śāstra it is said, janasya moho ’yam ahaṁ mameti This “I and my” philosophy is illusion. So this illusion means māyā. māyā… If you want to get out of this illusion, māyā, then you have to accept the Krishna’s formula. Mām eva ye prapadyante māyām etāṁ taranti te. Everything is there in the Bhagavad-gītā for guidance if we accept the philosophy of Bhagavad-gītā as it is. Everything is there. Peace is there, prosperity is there. So that is a fact. Unfortunately, we do not accept it. That is our misfortune. Or we misinterpret it. Krishna says in the Bhagavad- gītā, man-manā bhava mad-bhakto mad-yājī māṁ namaskuru. Krishna says that “You always think of Me,” man-manā bhava mad-bhakto. “Become My devotee.” Mad-yājī, “You worship Me.” Māṁ namaskuru, “And offer obeisances unto Me.” Is it very difficult task? Here is Krishna’s Deity. If you think of this Deity, Rādhā-Krishna, is it very difficult? Man-manā. You come into the temple and, just as a devotee, offer your respect to the Deity, man-manā bhava mad- bhakto. As far as possible try to worship the Deity, patraṁ puṣpaṁ phalaṁ toyaṁ yo me bhaktyā prayacchati. Krishna does not want your whole property. Krishna is open to the poorest man for being worshiped. What He is asking? He says, patraṁ puṣpaṁ phalaṁ toyaṁ yo me bhaktyā prayacchati: “With devotion, if a person offers Me a little leaf, a little fruit, a little water, I accept it.” Krishna is not hungry, but Krishna wants to make you devotee. That is the main point. Yo me bhaktyā prayacchati. That is the main principle. If you offer Krishna little things… Krishna is not hungry; Krishna is providing food for everyone. Eko yo bahūnāṁ vidadhāti kāmān. But Krishna wants your love, your devotion. Therefore He is begging little patraṁ puṣpaṁ phalaṁ toyaṁ. Man-manā bhava mad-bhakto. There is no difficulty in understanding Krishna and to accept Krishna consciousness. But we’ll not do that; that is our disease. Otherwise, it is not difficult at all. And as soon as we become devotee of Krishna, we understand the whole situation. Our philosophy, Bhāgavata philosophy, is also communism because we consider Krishna the supreme father, and all living entities, they are all sons of Krishna. …when we forget this philosophy, that Krishna is the supreme father, Krishna is the supreme proprietor, Krishna is the supreme enjoyer and Krishna is the supreme friend of everyone. When you forget this, then we come into this material world and struggle for existence, fight with one another. This is material life. So you cannot get… The politicians, diplomats, philosophers, they have tried so much, but actually nothing has become fruitful. Just like the United Nations. It was organized after the second great war, and they wanted that peacefully we shall settle everything. But there is no such thing. The fighting is going on between Pakistan and India, between Vietnam and America, and this and that. It is not the process. The process is Krishna consciousness. Everyone has to understand this fact, that we are not proprietor. Proprietor is Krishna. That’s a fact. Just like America. Say two hundred years ago the Americans, the European migrators, they were not proprietor—somebody was proprietor. Before them, somebody was proprietor or it was vacant land. The actual proprietor is Krishna. But artificially you are claiming that “It is my property.” Janasya moho ’yam ahaṁ mameti. This is called māyā. So Krishna advents for give us lesson. Yadā yadā hi dharmasya glānir bhavati bhārata. Krishna says, “My dear Arjuna, I come when there is discrepancies in the process of religious life.” Dharmasya glānir bhavati. And what is dharma? The simple definition of dharma is dharmāṁ tu sākṣād bhagavat- praṇītam. This is dharma. Dharmāṁ tu sākṣād bhagavat-praṇītam. Just like what do you mean by law? Law means the word given by the state. You cannot make law at home. That is not possible. Whatever the government gives you, that “You should act like this,” that is law. Similarly, dharma means the direction given by God. That is dharma. Simple definition. You create dharma. I have created this dharma, another man creates another dharma; these are not dharma. Therefore, where the Bhagavad-gītā ends, that sarva-dharmān parityajya mām ekaṁ śaraṇaṁ , this is dharma—to surrender to Krishna. Any other dharma, they are not dharma. Otherwise, why Krishna asks sarva-dharmān parityajya: “Give up”? He said that dharma-saṁsthāpanārthāya sambhavāmi yuge yuge: “I advent to establish the principles of religion.” And at last He says, sarva-dharmān parityajya. That means the so-called dharmas that we have manufactured, man-made dharmas, they are not dharmas. Dharma means what is given by God. But we have no understanding what is God and what is His word. That is the modern civilization defect. But the order is there, God is there—we won’t accept. Where is the possibility of peace? The order is there. Krishna says, the Supreme, bhagavān uvāca. Vyāsadeva writes bhagavān uvāca. One should know what is bhagavān. Vyāsadeva could have written Krishna uvāca. No. He says… If one may misunderstand Krishna, therefore he writes in every stanza, every verse, śrī bhagavān uvāca. So Bhagavān is there. Bhagavān is speaking. Bhagavān is accepted by all the ācāryas. Rāmānujācārya, Madhvācārya, Viṣṇusvāmī. Latest, Lord Caitanya Mahāprabhu also, even Śaṅkarācārya, he also accepts Krishna—sa bhagavān svayaṁ Krishna. So the verdict of the modern ācāryas, and in the past also, Vyāsadeva, Nārada, Asita, everyone accepted Krishna, the Supreme Personality of Godhead. Arjuna, who heard from Krishna, after understanding Bhagavad-gītā, he said, paraṁ brahma paraṁ dhāma pavitraṁ paramaṁ bhavān puruṣam ādyaṁ śāśvatam. It is awakened. Love for Krishna, devotion for Krishna, is there within everyone’s heart, but he has forgotten. So this Krishna consciousness movement is simply meant for awakening that Krishna consciousness. This is the process. Just like when you are sleeping, your, I have to call you loudly—“Mr. such and such, such and such, get up. You have got this business.” No other senses will act when you are sleeping. But the ear will act. Therefore, in this age, when people are so fallen they will not hear anything, if we chant this Hare Krishna mahā-mantra, he’ll be awakened to Krishna consciousness. This is practical. Our human life, the ultimate goal of human life is to achieve immortality. Tyaktvā dehaṁ punar janma naiti , This is our…, we have forgotten this. We are simply leading the life of cats and dogs, without any knowledge that we can achieve that perfection of life when there will be no more birth, no more death. We do not understand even that there is possibility of amṛtatvam. But everything is possible. Amṛtatvam. Nobody wants to die. That’s a fact. Nobody wants to become old man, nobody wants to become diseased. This is our natural inclination. Why? Because originally, in our spiritual form, there is no birth, no death, no old age, no disease. So after evolutionary process down from the aquatics, birds, beasts, plants, trees, when you come to this form of human form of body after… Aśītiṁ caturaś caiva lakṣāṁs tād jīva-jātiṣu. This is evolutionary process. We come to the human form of body. Then we should know what is the goal of life. The goal of life is amṛtatvam, to become immortal. That you can become immortal simply by becoming Krishna conscious. Krishna says. It is a fact. We have to simply understand. Janma karma me divyaṁ yo jānāti tattvataḥ. If you try to understand Krishna in truth, tattvataḥ, then, tyaktvā dehaṁ punar janma naiti, after giving up this body, you don’t accept any more material body. And as soon as you don’t accept any material body means you become immortal. Because by nature we are immortal. Simply struggle for…, unnecessarily. The best thing is that you have enjoyed sense life in so many varieties of life, as cats, as dogs, as demigods, as tree, as plants, as insect. Now, in this human form of life, don’t be captivated by sensuous life. Just try to understand Krishna. That is the verdict of the śāstras. Nāyaṁ deho deha-bhājāṁ nṛloke kaṣṭān kāmān arhate viḍ-bhujāṁ ye . To work very hard like dogs and hog for sense gratification is not the ambition of human life. Human life is meant for little austerity. Tapo divyaṁ putrakā yena śuddhyet sattvam. We have to purify our existence. That is the mission of human life. Why I shall purify my sattva existence? Brahma-saukhyam tv anantam. Then you get unlimited pleasure, unlimited happiness. That is real pleasure. Ramante yogino ’nante satyānanda-cid-ātmani iti rāma-padenāsau paraṁ brahmābhidhīyate. Krishna claims that “I am everyone’s father.” Therefore, He is very much anxious to make us peaceful, happy. Just like the father wants to see his son is well situated and happy; similarly, Krishna also wants to see every one of us happy and well-situated. Therefore He comes sometimes. Yadā yadā hi dharmasya glānir bhavati This is the purpose of Krishna’s advent. So those who are servants of Krishna, devotees of Krishna, they should take the mission of Krishna. They should take up the mission of Krishna. That is Caitanya Mahāprabhu’s version. Krishna-upadeśa. Just try to preach what Krishna has said in the Bhagavad-gītā. That is the duty of every Indian. Caitanya Mahāprabhu says. bhārata-bhūmite manuṣya janma haila yāra janma sārthaka kari para-upakāra. So Indians, Indians are meant for para-upakāra. Indians are not meant for exploiting others. That is not Indians’ business. Indian history is all along for para-upakāra. And formerly, from all parts of the world, used to come to India to learn what is spiritual life. Even Jesus Christ went there. And from China and from other countries. That is history. And we are forgetting our own asset. How much we are callous. Such a great movement, Krishna consciousness, is going on all over the world, but our Indians are callous, our government is callous. They do not take. That is our misfortune. But it is the Caitanya Mahāprabhu’s mission. He says any Indian, bhārata bhūmite manuṣya janma, if he’s human being, he must make his life perfect by taking advantage of this Vedic literature and distribute the knowledge all over the world. That is para-upakāra. So India can do. They are actually appreciating. These Europeans, American young men, they are appreciating that how great… I get daily dozens of letter, how they are benefited by this movement. Actually, that is the fact. It is giving the life for the dead man. So I shall specially request the Indians, especially His Excellency, kindly cooperate with this movement, and try to make successful your life and others’ life. That is the mission of Krishna, advent of Krishna.